In the first book of the Mighty Meg series, Meg receives a ring for her eighth birthday and wakes up with superpowers! 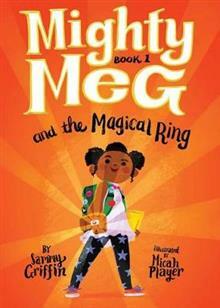 Meg's life is turned upside down when a magical ring gives her superpowers! But Meg isn't the only one who changes. Strange events start happening in her once-normal town, and now Meg must use her brand-new superpowers to keep everyone safe. Can Meg master her new powers and find the courage to be the hero her town needs? Sammy Griffin is a children's book author and super-geek who fangirls over superheroes and comic books in real life. She lives in Idaho Falls, Idaho with her super-geek family. Micah Player was born in Alaska and now lives in the mountains of Utah with a schoolteacher named Stephanie. They are the parents of two rad kids, one brash Yorkshire terrier, and several Casio keyboards.